Moving your warranty system online will save your business time and money. 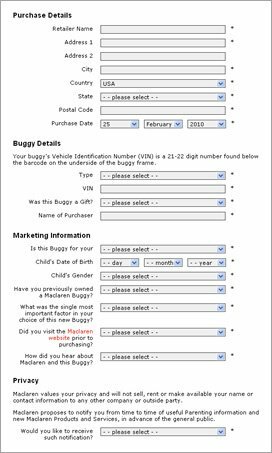 This online Warranty system allows customers to register their own purchases by completing a short online registration process (a form) on your website. All new customers are invited to create a secure online warranty account, with a unique username and password. The customer details are saved on your system and an account reminder note is sent to them for safe keeping. Customers add products to their warranty account as they are purchased. This information includes details such as Product Code, any applicable serial numbers and when and where the item was purchased. For products requiring regular service this information can be harnessed to trigger the dispatch of automated reminder Emails or text messages (SMS), either to your staff or your customers (or both) to ensure regular servicing is up to date. Extended Warranty systems are easily implemented. They can be offered in conjunction with a service package or simply by paying an extended warranty fee. Reminder notes and offers to extend the warranty can be sent automatically to registered customers via Email or text messages (SMS). The extended Warrant and/or service payments can be integrated with an online payment facility and automated reminders, it's fully automated. You can see spiderscope's warranty system in action at Aqualux Bathrooms. It's also in the process of being implemented for Lifeline Fire Systems, one of the UK's leading fire suppression systems companies. Take a look at the stuff you actually want to see, some of our previous designs incorporating warranty systems.